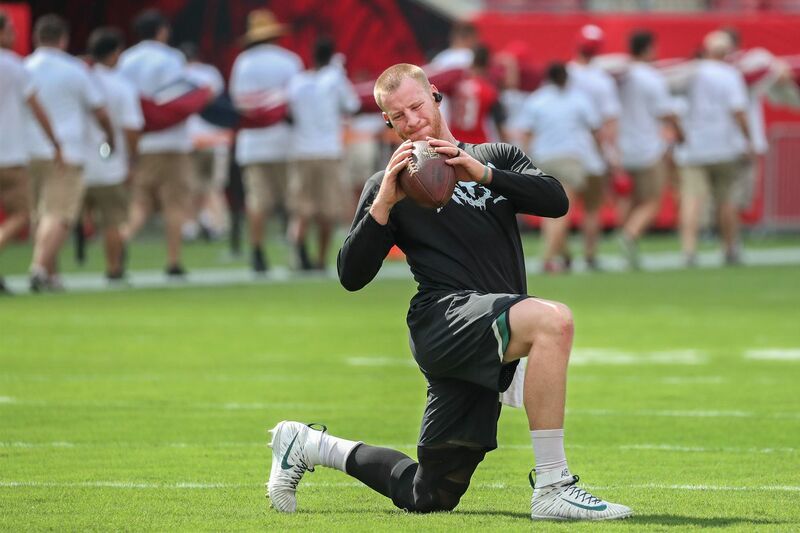 Carson Wentz stretches during warm-ups on Sunday at Tampa's Raymond James Stadium. Is this going to be the real Carson Wentz the Eagles get back Sunday against the Indianapolis Colts, the hip-wiggling, pass-rush-sidestepping, MVP-level quarterback who doesn't need an immaculate pocket to make big plays? Doug Pederson was asked that question more than once Monday, after the Eagles' coach announced that Wentz has been medically cleared and is ready to take his job back from Nick Foles, nine months and four days after surgery to repair left ACL and LCL injuries. Two things about Pederson's answers: 1) He doesn't think carefully tiptoeing Wentz back into the fray is any kind of option, and 2) Bottom line, Pederson doesn't really know how mobile and elusive Wentz can be, wearing a knee brace, with his knee probably still at least a couple of months from feeling the way it felt before he injured it. Nobody knows. Usually it's a full year after surgery before everything is completely back to normal. Pederson said he will issue the usual cautions about the need for a QB to protect himself, "but there are no limitations." "The thing is, I'm not going to coach scared. I'm not going to coach paranoid," Pederson said. He added that game plans might feature more max protection. "But I don't think that things are going to change too much." Medical professionals who have dealt with these kinds of injuries say Wentz probably won't be the 2017 version right away. "The brace alone will limit his mobility," said one orthopedic surgeon who has worked with pro athletes, who preferred not to be quoted by name. That surgeon added that typically, there are psychological barriers to be overcome, such as "making hard cuts and changing direction" while exposed to contact, something that never happens to quarterbacks in practice. The surgeon said the LCL injury will create at least a little looseness in Wentz's knee that will never go away, that he will notice when making hard cuts, and will have to get used to feeling. Another sports orthopedic surgeon, who also asked not to be identified, said "you're not going to see the same Carson Wentz" right away. He compared Wentz to "a Ferrari that hasn't raced in a while." He also reiterated what the first surgeon said about practice and games being very different. "You can expect him to be a little tentative when there are guys falling in front of his leg," he said. But he added that all quarterbacks coming back from such injuries go through this, and after a few weeks, they adjust. Dr. David Chao, an orthopedic surgeon and former head team physician for the Chargers, tweets about sports injuries as @profootballdoc and analyzes them for the San Diego Union-Tribune. Chao has written that Wentz could have played in the season opener as strictly a pocket quarterback, but that given the two-ligament repair, he won't be 100 percent until at least the second half of the season. Ligament repairs continue to strengthen for up to two years. "If they start him in Week 3, I don't see how it is with the same playbook as before his December injury, with full run/pass options," Chao wrote over the weekend. The Eagles have been listing Wentz as "limited" in practice because until Monday, he was not cleared for contact. Pederson was asked if he'd considered giving Wentz another week or so as a full practice participant before starting him. "He's cleared, he goes. I've said all along that he's our guy, we drafted him to be our guy," said Pederson, who compared the situation to his decision to sit out some starters during the preseason, then rely on them heavily for Week 1. Fans might have noticed that the two players Pederson specifically referenced – Jason Peters and Darren Sproles – are both nursing minor injuries right now. Sproles sat out the Tampa game with a hamstring problem, and Peters played just eight snaps before leaving with a quadriceps pull. Of course, Wentz is a decade or so younger than those guys. "It's going to take some time [for Wentz] to get back into the rhythm and flow of the game," Pederson said. This is an interesting week for Wentz to return in that the Eagles are hosting the Colts and their head coach, former Eagles offensive coordinator Frank Reich. The Colts' defense isn't considered elite, but there might not be anyone anywhere with more insight into Wentz's game and the Eagles' offense than Reich. The final question of Pederson's news conference was another stab at asking him about Wentz's mobility, Wentz's ability to buy time in the pocket. Will that be there for him Sunday? "We'll see," Pederson said, and left the lectern. • The Eagles didn't have the cap room to hold on to Trey Burton or Torrey Smith, but they'd both come in handy right about now, wouldn't they? • That "week to week" answer from Doug Pederson when asked about Alshon Jeffery's return was not great news. I'm told a rotator-cuff repair often can take from eight to 10 months to heal. Jeffery has seven months in the books. • When you're thinking about how the Eagles couldn't hit anything downfield until midway through the third quarter, also consider that the Bucs were without their two starting corners, Vernon Hargreaves and Brent Grimes. That's how bad the Birds' passing game was. • There was a time when a play like Sunday's Nick Foles fumble would have been ruled a forward pass. The last several years, though, it's almost always been ruled a fumble. The rusher didn't hit Foles' hand or arm, didn't hit the ball. Arm moved forward, ball fluttered forward. I would call it a pass, regardless of which team's QB threw it, but I guess I'm in the minority. If the ball looking funny coming out of the passer's hand makes it a fumble, I'm pretty sure I've covered some quarterbacks who never threw an actual pass. • I don't think Ronald Darby is an unwilling tackler. He was credited with eight solo stops Sunday. But he really misjudged O.J. Howard's speed on that pass over the middle that Howard broke down the sideline for a 75-yard touchdown. Darby had a shot at Howard as he turned upfield, started to launch, then realized Howard was past him. "Just a bad play, a missed tackle. … We killed ourselves. We made a lot of mistakes," Darby said afterward. • Eagles who played well Sunday: 1. Nelson Agholor. 2. Lane Johnson. 3. Cam Johnston. 4. Zach Ertz. 5. Corey Clement. And that might be about it. Fletcher Cox had the best game of any d-lineman, but he was a long way from dominant. That you couldn't cover Tampa's wide receivers by stationing your cornerbacks in St. Petersburg? Zach Ertz was not targeted for a pass in the first quarter. He was targeted 13 times and made 11 catches for 94 yards in the final 45 minutes. Jake Elliott's 42-yard miss Sunday not only extinguished any spark of momentum the Eagles might have carried into halftime, it had bigger consequences later in the game, as the visitors tried to climb out of a 27-7 hole. Of course, we don't know that Tampa Bay would have done everything exactly the same way, had the score been a little closer. And frankly, the way the game felt, even if the Eagles had gotten back to 27-27, Ryan Fitzpatrick probably would have flicked his arm a few times and restored the lead. But we'll never know.